Each summer I count down the days to the atomic bombing of Japan (August 6 and August 9, 1945), marking events from the same day in 1945. I've written three books on the subject including Hiroshima in America (with Robert Jay Lifton), and Atomic Cover-Up (on the decades-long suppression of shocking film shot in the atomic cities by the U.S. military). And today he gives a letter to Stalin, which confounds the Soviet leader. Earlier, Stalin had promised to declare war on Japan around August 7. Now Truman writes that more consultation is needed. Truman had earlier pushed for the quick entry, writing in his diary "fini Japs" when that occurred, even without use of The Bomb. Now that he has the bomb in his "pocket" he apparently hopes to stall the Soviets. 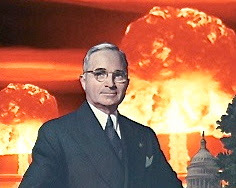 --Truman has also approved statement on the use of the bomb, brought to him last night in Germany by a courier, drafted by Secretary of War Stimson and others, and ordered it released after the bomb drop. A line near the start has been added explicitly depicting the vast city of Hiroshima (occupied mainly by women and children) as nothing but a “military base.” The president, and the drafters of the statement, knew was false. An earlier draft described the city of Nagasaki as a “naval base” and nothing more. There would be no reference to radiation effects whatsoever in the statement—it was just a vastly bigger bomb. —The Potsdam conference ended early this morning, with Truman expected to head back to the US by sea tomorrow. —The “Little Boy” atomic bomb is now ready for use on the island of Tinian. Under the direction of the lead pilot, Paul Tibbetts, practice runs have been completed, near Iwo Jima, and fake payloads dropped, with success. Truman’s order had given the okay for the first mission later this day and it might have happened if a typhoon was not approaching Japan. I've been trying but am unable to remember how old I was when I learned about/understood the effects of the US atomic bombing of Hiroshima and Nagasaki -- and how. I know I understood it by the time I was ten, during the Cuban missile crisis. I think it must have been something I read in the New York Times; I wonder if by 1960 there weren't 15th anniversary stories in August. I know you must have read a ton about the subject; do you have a sense of when the US public were really exposed to the truth of the effects of The Bomb?